MENLO PARK and PORTOLA VALLEY, CALIF. – Innovation is a learning journey — one we’re constantly co-creating and recreating to meet the needs of a world in flux. 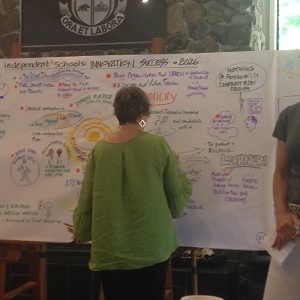 NAIS’s Innovation Task Force is at the forefront of the journey’s unfoldment in independent schools. 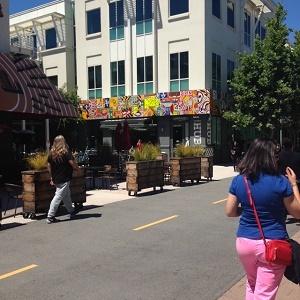 In late June, I joined members of the task force — 10 independent school leaders, NAIS Vice President of Education Technology and Learning Services Kawai Lai, and NAIS Senior Vice President of Advocacy and Education Innovation Jefferson Burnett — in Silicon Valley for a capstone experience marking the group’s progress. The large courtyard, with a blacktop road running through the middle, is reminiscent of Disneyland. That’s no coincidence — Facebook hired Disney imagineers to design it. Offices have open floor plans. In War Rooms, groups of employees come together to work on projects. Hackathons, a long-running company tradition, are all-night coding workshops where employees assemble to generate new product concepts and create prototypes in an open, fun environment. Facebook’s “Like” button was conceived in a hackathon. Employees can pursue creative disciplines, such as woodworking and art, right on campus. They just pay for materials. There’s tons of free food (we stopped at the sweet shop for free ice cream cones and other treats) and an arcade. A health center sits in the center of the courtyard. Wednesday is a teleworking day; meetings are typically not held on this day. 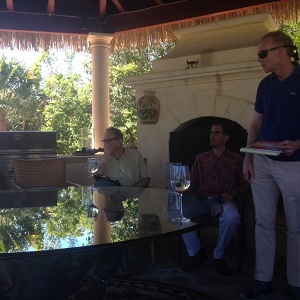 Later that day, we gathered for an outdoor fireside chat at an Airbnb home where some group members were staying. John Kao, an expert in innovation and organizational transformation, shared the keys to innovation as he sees them. Kao defines innovation as a portfolio of capabilities at the individual, institutional, and societal levels that enable you to continuously realize a desired future. Capabilities – These are skills you develop over time with considerable practice. Continuous – Innovation is a journey so you must keep working on it. He compared this with companies that treat innovation as a campaign. Desired future – Innovation needs a purpose. “Otherwise, it’s just good hygiene,” he said. Figure out the problem you’re trying to solve. Innovation is the means to do so. Here he addressed the concept of a wicked problem, a term coined by Horst Rittel, a design theorist and professor. Rittel sought to understand why certain issues are insoluble. Fundamentally, they are hard to define and multidimensional. They’re wicked not because they’re evil but because they’re resistant to resolution. Today, gun control and climate change are two examples. For independent schools, equity is a wicked problem, a group member said. Enter Generation Z, which is ethically inclined and seeks to improve the world’s condition. (Demographers say Gen Z begins anywhere from the late 1990s to the mid-2000s.) Kao decided he wanted to help these youths achieve their desire. He founded an organization, EdgeMakers, whose mission is to empower young people worldwide to change the world ahead of schedule. The organization follows a cycle of plant (germinating new ideas), grow (creating optimal conditions for ideas to thrive), harvest (converting fruits of other stages to value), according to Kao’s EdgeMakers Manifesto. Kao, an accomplished pianist, ended the chat at the living room piano where he played some jazz tunes for us. An enchanting performance — with a deeper purpose. He was demonstrating how improvisation infuses the innovation process. As he described it, with deliberate practice, a person is able to respond with what’s right for the moment. This day laid the groundwork to talk about innovation related to independent schools. 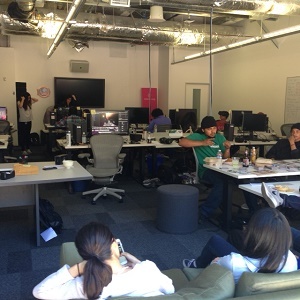 As the weekend progressed, we referenced the Facebook sign and the company’s all-inclusive culture as well as the wicked problem concept that John Kao introduced to us. The following day, we discussed takeaways from the task force’s interviews this past spring with independent school board members, administrators, and teachers. The constituents described innovation from their vantage points. Our group drew connections among these stakeholder groups, crystallized insights, and exposed tensions. We shared and brainstormed at Woodside Priory School, a 6–12 grade day and boarding school of 370 students. The school was founded in 1957 by a group of seven Hungarian Benedictine monks. Nestled in Portola Valley, the 51-acre campus is a true mix of old and new. 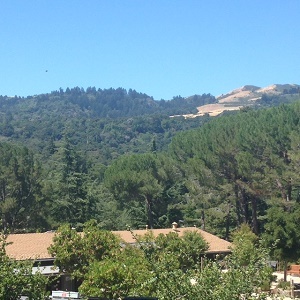 Monks still reside here; towering redwood trees, warm outdoor plazas, an array of solar panels, state-of-the-art facilities, a large garden, and a meditative Labyrinth all dot the picturesque landscape. I discovered how easy it was to lose and find myself while looking out at the sweeping mountain vistas. Currently, The Priory is embarking on its own innovative project, focusing on how students can achieve balance in their lives and assessing the degree to which they’re living a balanced life. The school recently received a $50,000 grant from the E.E. Ford Foundation for this work. In these many ways, Woodside Priory School was an ideal place to gather to discuss innovation in independent education. All stakeholder groups cited trust as vital for innovation. Innovation is connected to mission. Modeling behavior is crucial for everyone. A school ought to develop an innovation narrative that all can understand and share. Innovation is a social activity. Innovation requires moving from being shown the way to being part of creating the way. Innovation is exhausting if you’re pushing against resistance. Purpose and Vision – Leaders must outline innovation’s purpose and how it fits their vision for a brighter, sustainable future. Life Skills – Everyone must hone key skills: collaborating, communicating, thinking creatively, solving problems, being adaptable, expressing empathy, and pushing beyond comfort zones. Day 3: How Might We … Move Forward on a Firm Foundation? At the capstone’s conclusion, Innovation Task Force members created a charge for their work going forward. 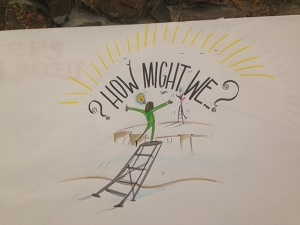 The group’s seminal question: How might we build future-wise school communities? Join us as we continue to shape this journey. You can share stories of innovation at your school in the comments or via email at pinkus@nais.org. Let’s learn together and build on others’ good ideas. Indeed, that is what brought this blog post together. To close, I send special thanks to Innovation Task Force members who attended the capstone in California: Chris Bigenho, Liz Davis, Laura Deisley, Sally Garza, Sophie Halliday, Larry Kahn, Howard Levin, Alex Ragone, Linda Swarlis, Task Force Chair Jenni Swanson Voorhees, Kawai Lai, and Jefferson Burnett as well as facilitator Andrea Saveri and graphic recorder Leslie Salmon-Zhu. I also want to recognize task force members Alex Inman and Jill Brown and advisory members Wendy Drexler, Shabbi Luthra, Demetri Orlando, and Jason Ramsden who have contributed a great deal but could not be in California. For more coverage of innovation in education, visit my blog on NAIS Connect.